Eights tickets already won, 32 to go. Today I'm giving out only regular tickets - 5 of them. But please note that the tickets won't be ready for collection until Dec 12. The organisrs don't want their tickets flying around until a few days to the shows. Once I pick all 40 winners, I will submit your names to Flytime Promotion, and you will go to their office at E-Centre Yaba, with your I.D to collect your tickets. To win today's tickets here's all you have to do. The first five people to tweet 'Looking forward to seeing you in Nigeria for Rhythm Unplugged, Dec 18th' will get the tickets. His twitter handle is @therealmikeepps. CC me @lindaikeji and @flytimeevents. All the best. i would have loved to tweet this but it doesnt read write...i mean no offence or anything like that, its just that the #gbagaun will come up on MY timeline....you might wanna repost the correct thing for us to tweet! linda it me. how is your day i am in ph cities and i dont think am intreasted. just to say hi and also to tell you to help me out with that stuff we talk about. view my profile you will know me. 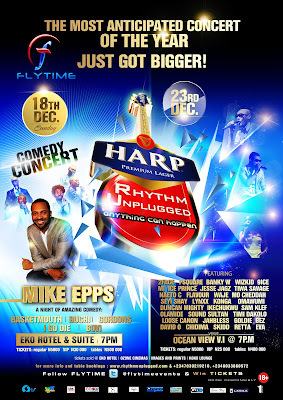 'Looking forwarding to seeing you in Nigeria for Rhythm Unplugged, Dec 18th'. How person wan take know if he don win? I answered the questions the last time. U shld try and correct the thing u wrote here sha, Anty Linda. "looking forwarding". Som pple that cant correct it theirselves hav bn blasting us on twitter. Thank you. 'Looking forward to seeing you in Nigeria for Rhythm Unplugged, Dec 18th'.